As PJ, one of the three kings of Casa Raia, organic winemaker and my professor for the week explained, wine grapes thrive in a hot, dry and windy climate with rocky soils generally uninhabitable by most other fruits and vegetables. This surprised me considering how plump and juicy grapes can be, but here, high atop the Tuscan hills of Montalcino, some of the world's best wine has thrived for generations. As you can see below, grape vines are extremely resilient plants that develop into strong treelike wood, but every superhero has his weaknesses and grapes are no exception. Below is the same branch a year younger. When young, grape vines can be carefully bent and twisted without breaking, carefully being the key word here (only one casualty on my resume). This flexibility is important for organizing and spacing the vineyard most efficiently. All living things compete for energy and space even within the same plant type, so in the late fall and winter when the vines have tangled together, pruning and tying help prepare the vines for the spring and summer growing season. Why can't they intertwine? Well, a grape's biggest weakness is its susceptibility to disease. If grapes are touching, they can more easily develop and quickly spread fungal disease. As the spring comes alive, grape buds grow quickly and at this early point in their lives they are very delicate. This is why it's important to prune and tie the vines which ensures that grapes will grow most predictably and manageably for the most efficient fall harvest. Another cause of fungal disease is humidity, this is where the dry, windy climate comes into play. Dry, so humidity doesn't create fungal diseases that can wipe out an entire vineyard and windy so any humidity can be swept away. This is extremely important when you depend on wine as your source of income and even more important when your wine can only be sold after a minimum of 4 years in wood barrels i.e. Brunello. Sloping hills are perfect for air flow and water drainage, two keys to preventing stagnant humidity. 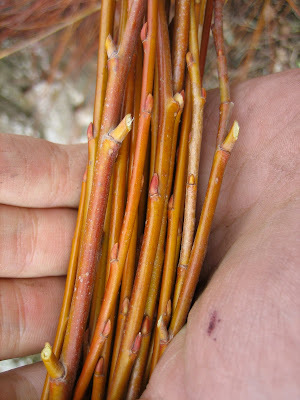 To fix this jumbled mess, PJ showed me that each one of these branches should be cut down to its most efficiently spaced and likely to survive buds. Using some guidelines, experience and instinct, PJ makes the decision as to which vines will be cut. He usually keeps no more than 3 upright buds for the longer vines and 2 for the shorter ones. Managing under 4 acres of organic land allows Casa Raia to avoid the industrial practices that many commercial producers resort to which may lead to greater quantities produced, but lack the rich, natural quality that Casa Raia's organic wines can have with uncontaminated vineyards. I don't know about you, but I'll take quality over quantity any time. The wine is a direct product of the energy that is put into the care of this property and the organically maintained soil the grapes are grown in. Although the vine arm below is naturally lining itself along the wire, it is important to untangle this and tie it entirely on one side because the arms can actually engulf the wire, which can be detrimental to a vine that can last decades producing grapes. 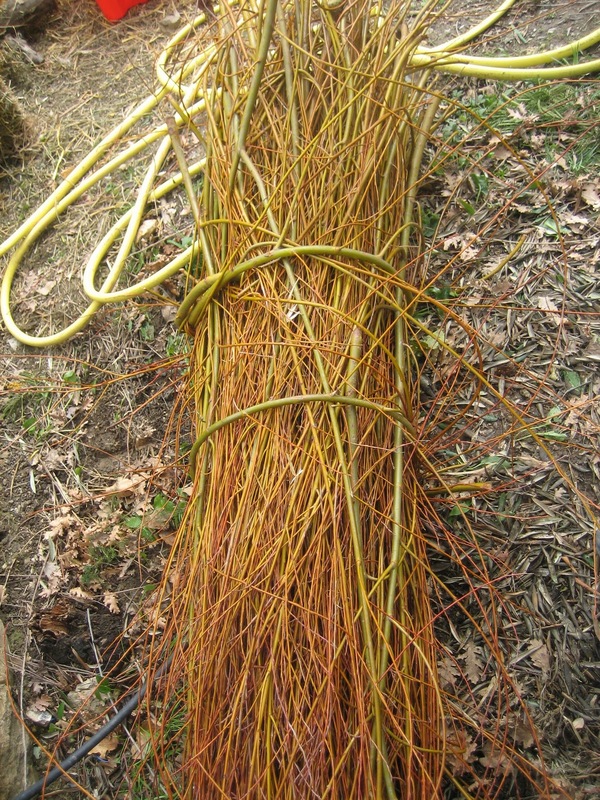 The most common practice for tying vines is plastic, the green shown in the picture below, but over time this plastic breaks and eventually litters the ground around the vines accumulating a lot of waste that is definitely not good for the soil and in turn definitely not good for the fruit. As we've spoken about previously, we are what we eat eats. PJ decided instead of continuing to accumulate unnecessary waste, he found a cleaner, more efficient and natural solution...willow branches. PJ's goal is to have the entire vineyard converted to willow ties by the next growing season and a ton of progress was already made this year with just the two of us. This left me with pockets full of plastic, but better than in the soil that's for sure. 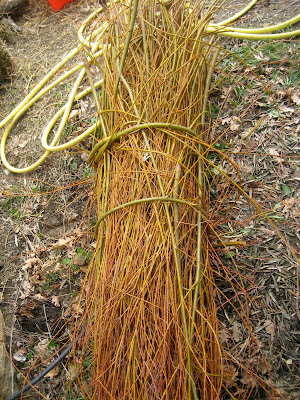 First, we split up these willow branches into smaller, more manageable pieces thin enough yet strong enough to tie each vine. Finally, with willow in hand we hit the fields. The first step is to find the natural point where the vine hits the wire and tie it there to hold it in place using a "simple" sliding knot. Pure satisfaction guaranteed every time. 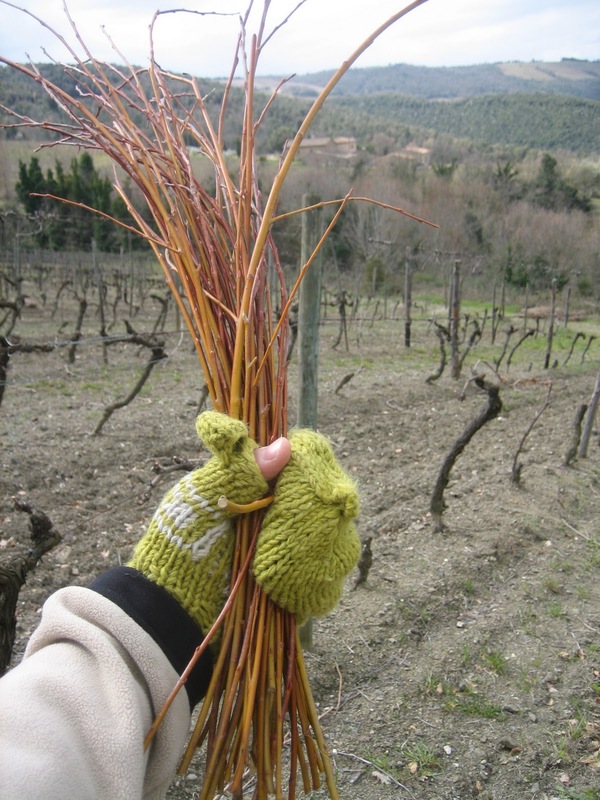 Second, we want to bend the vine arm until the end is firmly tied in place as well. Finally, if the middle is sticking out too much you can tie this too. 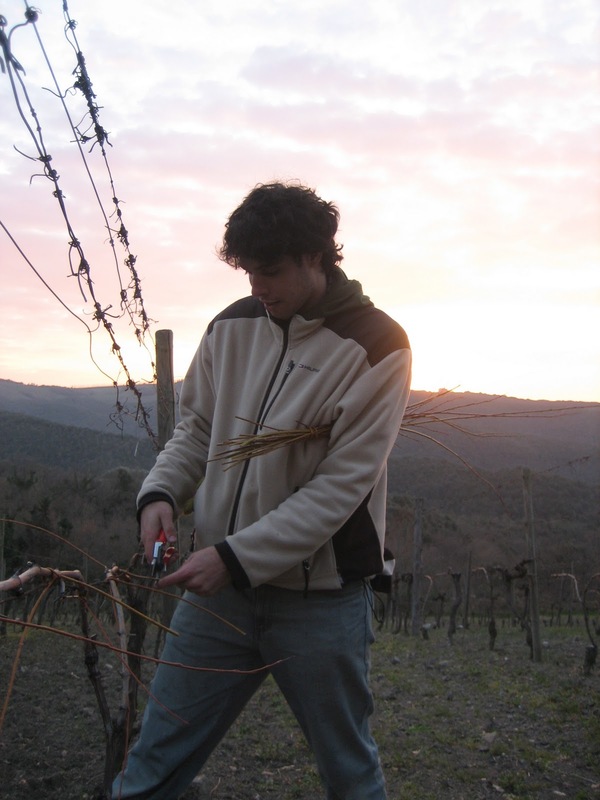 This method will help guide the vine into a tight hold with the horizontal wire, allowing the vertical arms to shoot straight up as we discussed earlier. Some vines have double arms in which case you want to leave about an extended palm's distance between each direction. Perfection, but let's just say this wasn't the first one of the day. After a full day of tying it eventually starts to become second nature. It took almost 3 days to finish the vineyard and there was still more to do when I left, so while it can be time consuming, the land, grapes and wine are all better off in the end. And so the struggle begins for these grapes as they enter what will hopefully be a hot, dry and challenging summer, yet all on the path to greater strength in the fall. Noah is only 1 years old, but already way ahead of the game. I still haven't seen him skip a step on his journey to the top (of any staircase). great picture of the little guy climbing the stairs. Sow You're Telling Me There's a Chance...Yeah!